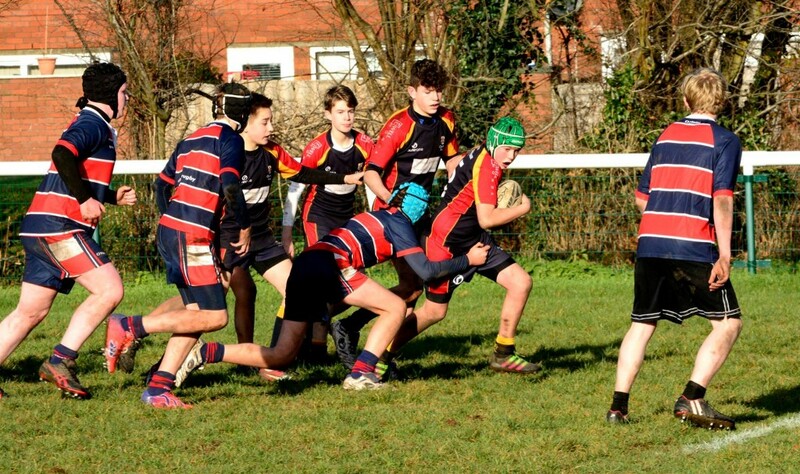 Chobham U14Bs welcomed Staines for a local derby on Sunday. Break time ‘banter’ had been in full flow in local schools, so while this was a friendly fixture no quarter would be given by either side. With Chobham have a large squad it was agreed the game would be played in four quarters to allow all the boys plenty of game time. Chobham were out of the traps quickly with penetrating running taking play immediately into the Staines half. Quick recycling and deft passing got the ball to MattW who was able to step inside his marker and open the scoring. DanP made the conversion and it was 7-0. Staines managed to put some pressure on the restart and earned a scrum which became a penalty. A kick to the corner set up good field position but the visiting three-quarters were tackled in midfield and conceded a penalty to ease the pressure. A bullocking run from Joe, backed by the rest of the pack pushed play towards halfway before DanP put in a long kick into the Staines half. Showing a clean pair of heels he beat the defence to the ball and used skills better suited to Saturday to sidefoot the ball towards the goal line where he again beat the defence to dive on the ball for the second score. Converting his own try pushed the lead out to 14-0 with less than 10 minutes gone. With their tails now up it wasn’t long before the score was extended once more. Lewis had a bit of space on the left before a crunching tackle from his opposite number halted progress. Presenting the ball well, it was quickly moving again and reached Andrew on the opposite wing. Showing pace his father has only the faintest memory of he gave the opposition no chance and went home from halfway. Once more DanP finished things off and it was 21-0. Chobham continued to play on the front foot playing the game in the Staines half. Finally over-enthusiasm caused the concession of a couple of penalties which Staines put the boot to and cleared into the Chobham half. Spinning the ball left, the left wing made a break being brought down close to the line. Staines showed good discipline to keep possession and eventually a miss pass to the right made the overlap for the winger to go over in the corner and Staines were on the board at 21-5. Swapping ends and Chobham were quickly on the attack again. A poor clearance kick gifted possession to the backs who went first left, then back right for MattW to score his second of the game to extend the lead to 28-5 after a fourth DanP conversion. 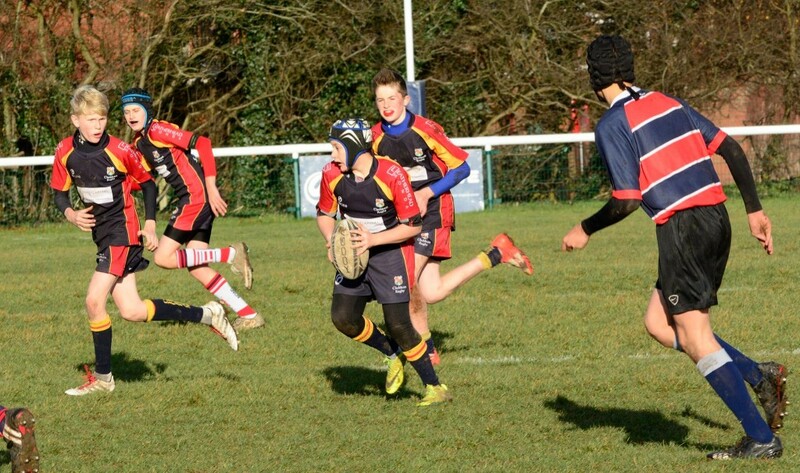 This seemed to be the spark that ignited the Staines performance. Their defence was up much quicker and closed down the Chobham attempts to play an expansive game. The Staines forwards were able to win their fair share of the rucks and win a couple of penalties that took them into the Chobham half. From a maul in midfield a gap in the blue defence opened and the Staines 12 was through and under the posts to make the score 28-12. It was if the visitors had found the magic formula. From a scrum after the restart the same centre scored in almost identical fashion helped by some lacklustre tackling and the deficit was down to 9 points at 28-19. It was most definitely game on with Chobham needing to reassert some control on the game. A penalty from the restart put Chobham up to the Staines 10 yard line. 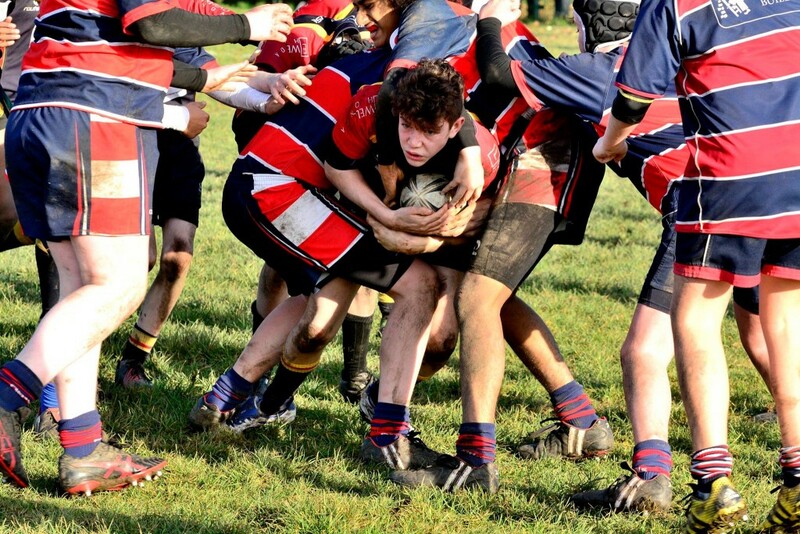 TommyW made good ground at first receiver and the forwards continued the good work attacking the fringes. A penalty was conceded to Chobham and Akin was given the tap. He was held up a couple of yards short but kept the play alive. Chobham proved left and then right before Akin popped up again to finish the move he started and score a try out wide on debut to stretch the lead to 33-19. Into the final phase of the game and Staines were able to keep Chobham pinned in their own half. The pace was starting to show as the ref needed a water break to counter the previous day’s festivities. 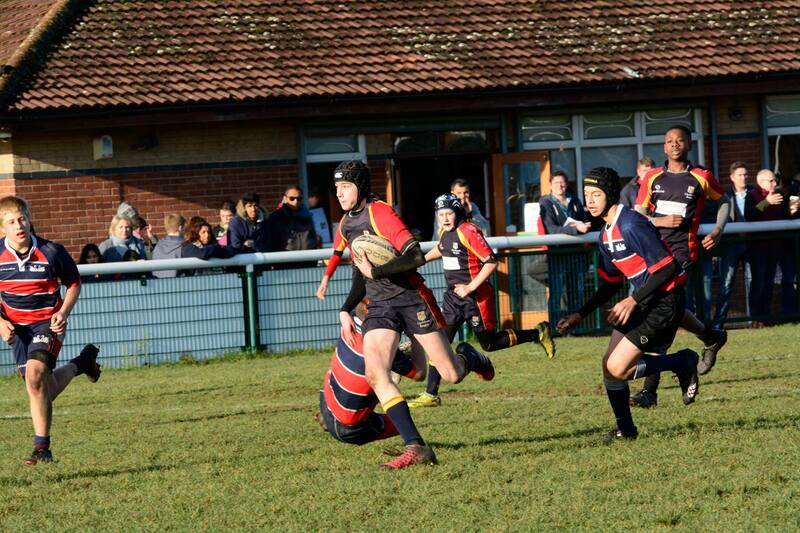 Staines had a scrum 5 yards out and were able to beat the tiring defence and cross under the posts to make it 33-26. From the restart SamO was first to the bouncing ball and won a penalty which was taken quickly and only try-line defence from Staines kept the home side out. At a 5 yard scrum Callum picked from 8 and had just enough steam to reach out in the corner for a sixth Chobham try and a 38-26 lead. With the clock ticking down Staines were desperate to get back in the game. 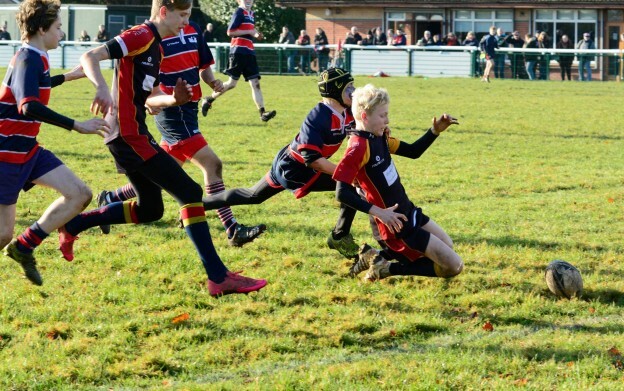 A last ditch tackle from Lewis on the double try scorer looked to have drawn a close as Chobham were able to carry from the resulting scrum into the Staines 25. A loose pass though gave Staines the put in at another scrum and this time the centre was able to complete his hat trick as he scorched away from the defence, but crucially wide enough out to keep the difference at 7 points, Chobham leading 38-31. Staines made one last attempt to level the score and looked to be on the way, before MattW brought the centre down once more. Staines retained possession, but crucially the ruck was slow and the defence had re-organised to snuff out the attack as Staines conceded a penalty. The final score was a narrow victory for Chobham in an entertaining game for all on the sidelines, with the home lads just having bragging rights come Monday morning. Squad: Joe, TomMcG, Billy, Max, Nathan, Callum, Harrison, Hugh, SamO, DanP, Lewis, TommyW, Aran, Andrew, MattW, Akin, Ethan, Jacob, Ben, Samuel, Rhys, Finn.